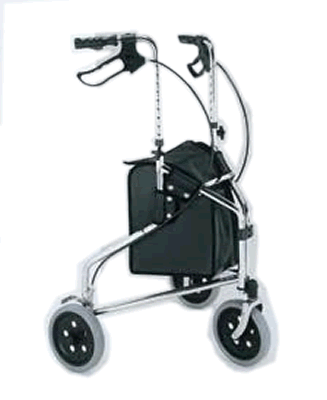 3 Wheel Rollator, BUY Three Wheel Rollator, Rollator Walker, W340. 3 Wheel Rollators, manufactured by Merits, are lightweight with a Three Wheel Rollator design. The handle tubes are secure, because they bolt directly into the frame. These handles are also adjustable, so that people with a variety of heights can comfortably use it. Rollator Walkers are ideal for increasing mobility with less safety risks. Merits Rollators feature a loop brake that can be activated when you stop the Rollator Walker, preventing falls due to the rollator moving forward. 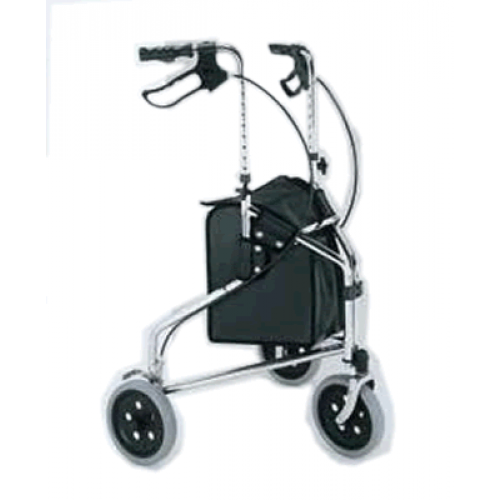 These 3 Wheel Rollators include a vinyl pouch that is perfect for stowing a purse, wallet, or any other item that you may need while using this rollator. Adjustable height for optimal comfort. Vinyl pouches are perfect for storing wallets, purses, or other small items. Durable bolt in knob stays secure. A brake cable has snapped on each of my Rollators. The design does not allow the cable to be rettached. Is there any way to obtain replacements? This item does have a limited lifetime warranty, so you may be able to file a warranty claim through Vitality Medical. Give us a call at your convenience and speak with one of our customer service representatives to find out if a claim can be made on your behalf. This is an excellent product that arrived quickly and well packed. Based on the speed with which they fulfilled the order, I would easily order again from Vitality Medical. Lightweight versatile walker. Easily transported. Excellent indoor & outdoors.